Aren't make up deliveries the best way to end a naff day? After seeing a load of bloggers 2015 favourite products I went a little cray online shopping throughout this week and my bank has taken a slight beating, but I have finally got my hands on a bunch of products I have been wanted for AGES!! I haven't even had a chance to try any of these yet but I am so so so so excited about them, so here is an unboxing/first impressions/high end haul. I am so happy to finally say I am the proud owner of the Anastasia Beverly Hills Cream Contour Kit!! This kit is all over social media along with the powder version and if you haven't seen it before - where have you been? First of all the packaging is gorgeous, it's so simple yet looks so classy. Just from swatching this product I can already tell i'm going to get on with it so well, it is so creamy and just feels amazing quality. I obviously went for the Light shade as i'm pretty pale however it is also available in Fair, Medium and Deep. They retail at £39 but of course you get what you pay for! 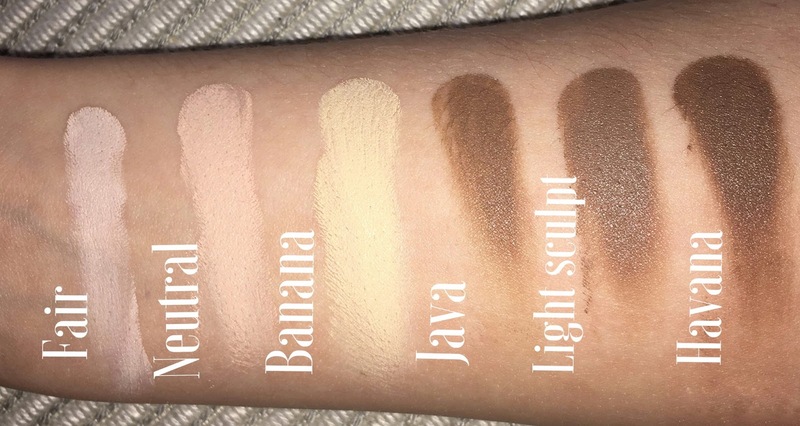 There are 3 highlighting shades Fair, Neutral and Banana, then there are 3 contouring/sculpting shades Java, Light Sculpt and Havana which I have swatched below. I picked up the new Brow Definer from Anastasia Beverly Hills after seeing so many videos on how amazing this makes your brows! I picked up the shade Dark Brown but there are plenty of others available for all different hair/skin tones. It's double ended which I love! You get the definer one end and a brush on the other end which will be really handy for travelling. This one retails at £16 and you can pick one up here. Next I picked up the Becca Shimmering Skin Perfector x Jaclyn Hill in Champagne Pop which you can grab here, I have seen this on so many peoples favourites - for example KathleenLights, InTheFrow and Danielle Mansutti. After seeing it in the flesh on a friend I had to purchase it and trust me if you ever get to try it you will most likely buy it too! It's the perfect peachy/gold I honestly think this would look good on anyone. I have been after a fan brush for MONTHS and I finally got the Zoeva 129 Luxe Fan Brush. It's super soft yet sturdy so this and the Becca highlight are going to be a match made in heaven! Again these are also ALL over social media and are such amazing brushes! I have a couple from the Real Techniques Bold Metals collection already and I couldn't resist these two! They're so soft and I love their shape, it makes it super easy to hold and apply your products. They are actually quite heavy but this actually makes them a lot easier to control, plus the colours are gorgeous. Mac have brought out a new collection of liquid lipsticks, YES I REPEAT MAC HAVE LIQUID LIPSTICKS! Every single colour in this collection is stunning and from the swatches you can see how pigmented they are too! How gorgeous are these?! They are £21 each and you can grab them here. Thank you Danielle Mansutti. I now smell INCREDIBLE. This perfume is absolutely gorgeous and I already know I will be repurchasing this. It is pretty sweet but smells delicious. Not to mention the packaging is the cutest!!! This is the Viktor & Rolf Bon Bon.